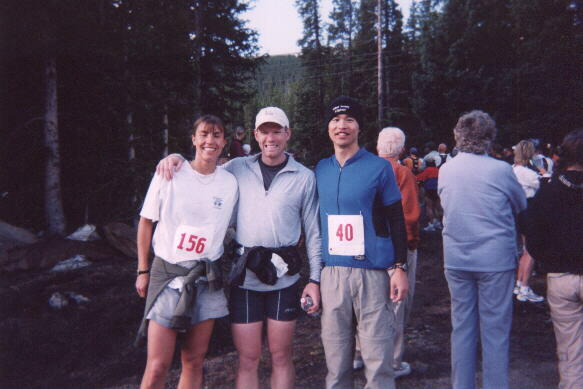 “I have pretty low expectations for this race,” I conceded, while tellinq my friends Anne & Shane about the Mt. Evans Ascent when we met up at Adrienne and Micah’s wedding celebrations in Longmont. 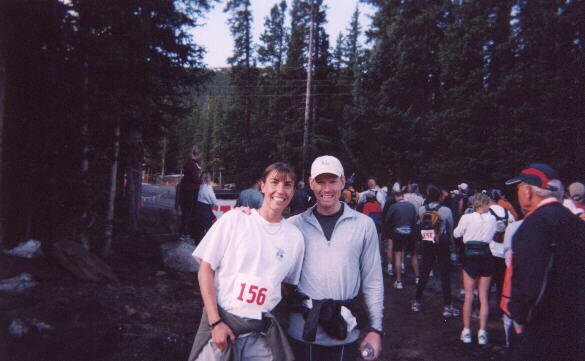 Indeed, initially I wanted to do another race in Colorado instead–the Steamboat Springs Marathon–on the very same day of this event, figuring that the longer and flatter course would be more appropriate training for the upcoming Ironman Coeur d’Alene triathlon. However, the Steamboat Springs Event was sold out–perhaps due in part to a recent Runner’s magazine article rating it as one of “America’s most beautiful marathons.” The Mt. Evans race, then, at “only” 14.5 miles, would have to do. So I sent in my $30 early registration fees for it in early May. A few weeks later, I started reading more about the race and mountain, and it was only then that I became a lot more enthusiastic. I expressed so much enthusiasm that my 2 friends, both very athletic themselves, expressed interest in participating in the race. “There’s a 30% chance that we’ll be there,” said Shane, as we parted ways after festivities at the Boulder ‘Res’. “You should definitely come; it’ll be good training for your upcoming Escape from Alcatraz tri,” I said. 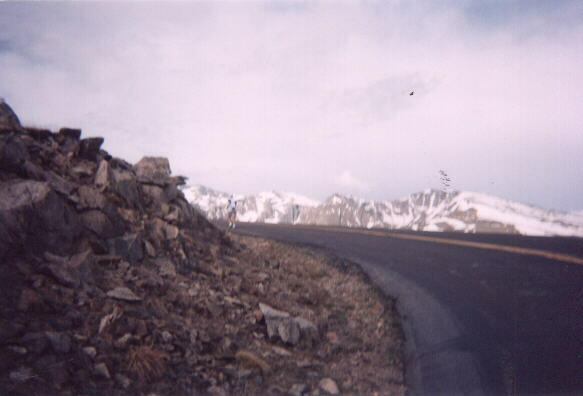 The last time I had been over 14,000 feet (Mt. Whitney 9/00), my body had performed less than stellar. Dehybration, lack of acclimitization, and perhaps ascending more rapidly than recommended, all lead to the worst headache I’ve ever had in my life. This time, I was determined to avoid repeating those mistakes. So the day before the race, I made sure I was well-hydrated, even though that meant havinq to wake up in the middle of the night to go to the bathroom. Or rather, go water a friendly tree as, not so unusual for me, I slept in my car. Yes, this was my plan for helping me acclimate to the altitude before the race–I’d drive up to the fee gate at Mt. Evans and park my car somewhere off the road not too far away. I settled on a little embankment 15 feet off the road about half a mile east of the fee gate, situating me at approximately 11,000 feet above sea level. It did take me a little while to go to sleep. I counted my pulse–64. Usually while lying in bed at home, it’ll 39 or so, so I thought this was a bit high. At midnight I woke up to pull out my sleeping bag, and counted it again, and it was still in the high 50’s. The effects of altitude. When I woke up in the morning, I popped an Advil in my mouth for good measure. I usually avoid all drugs or unnatural substances as much as possible, but I really wanted to avoid getting a headache. For me, this was more than just a race, or rather, a training run; it was to be a means to enjoy the grandeur of the verdant Colorado land from high above and to embark on a spiritual journey with Mother Nature. It never did occur to me that this could very well possibly turn out to be a spiritual journey against Mother Nature. After I parked and got out of my car, I walked 10 feet only to see… Anne. And there was Shane. I was so happy to see them. Anne, being the most sane of the three of us, had already decided she wanted to run some but didn’t care to go to all the way to the top, but Shane was a go. So we mooseyed on over to the start where the two of them were able to do day-of registration, and had a little bit of time to stretch. I observed what everyone else was wearing. 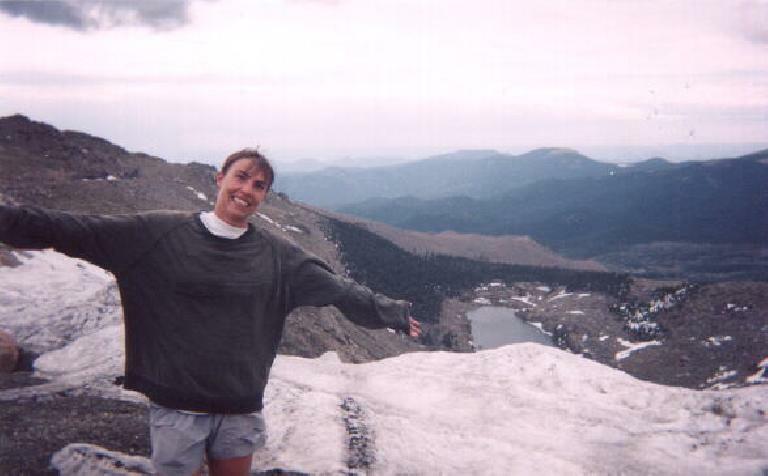 Having a long-sleeve shirt and/or jacket was mandatory because “it could be windy at the top,” but otherwise, most people were wearing shorts. As I was wearing long convertible cargo pants, arm warmers, beanie cap, my recumbent jersey and a windbreaker, I couldn’t help but feel a little overdressed. So right before the race started I rolled up my windbreaker and stored it in my left jersey pocket… just in case. This was not a gross overstatement. Running all uphill, in thin air, was just something I was not used to. My form was completely different–instead of taking long strides, I could only seem to take baby steps. Instead of landing on my heels, I was landing on my toes. Instead of running tall and erect I seemed to be leaning forward. Soon Anne mentioned something about not being able to run well if she was taking such short steps like the rest of us, so she took off. She was looking good. In contrast, I was still trying to get some sort of rhythm going, and was intent on taking it slow and steady. This was Shane’s strategy too, I think, as he dropped back somewhere in the first few miles. As the pack started to space itself out, I enjoyed the views of luscious pines lining the road and the occasional smattering of snow topping the rocks. Up here the air did seem a bit thinner than what I was used to, but not suffocatingly so. It took me two or three miles to get in a groove. This meant 25-33 minutes at the meager pace I was going. 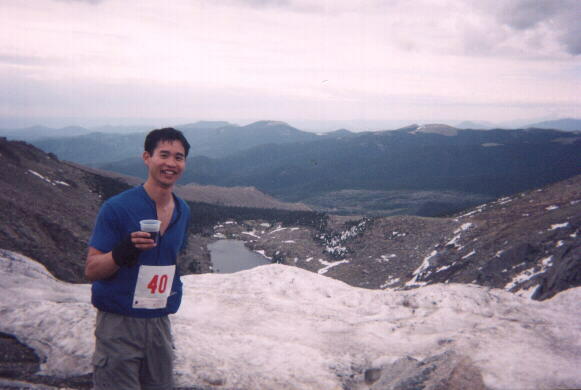 But as my primary goal in the early going was to make the time cutoffs–most notably, reaching Summit Lake by 10:30 a.m.–so as to not be disqualified. This time cutoff turned out to be very reasonable, as even at the 12.5-minute-mile pace I was going, I got there at 9:14 a.m. Waiting there was Anne, enjoying the view of Summit Lake. This would be her stopping point, so I too paused to chat with her, take some pictures, and imbibe a Coke. We then wished each other well and I was off again. 6 miles down, just 8 more to go… almost near the psychologically important halfway point. So far the race didn’t seem so bad. Up ahead were some of the more interesting animals I have ever seen during a race. 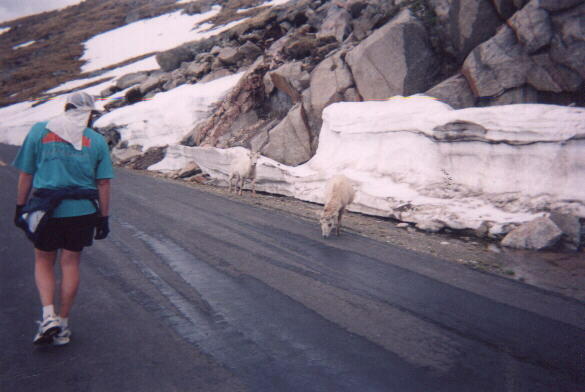 They were… mountain goats. Well, at least for a full 10 seconds. I quickly caught up to some people a good 100 feet ahead of me, but then had to start walking to catch my breath. As I did so some of the other runners trotted right past me, until I started “power walking.” It soon dawned on me that by “power walking,” I was going about as fast as I had been “running” (if you can call going a 12:30-minute-mile that), but seemed far easier. At this point I employed a completely different strategy–or rather, “experiment,” if you will–from the first 6 miles. I’d run at my “normal” sea-level pace for 10 seconds–usually to some inanimate object lining the road like a reflector pole–and then walk fast for about a minute. How wise this was remained to be seen, as I had never tried something like this before, but it felt comfortable, and more importantly, easily sustainable for the rest of the race. In addition, the split times on my watch (summarized in the table way down below) confirmed that my mile pace was remaining about the same as during the first steady miles. Somewhere in these miles a car ahead was descending down the road, and as it pulled to a near-stop along side of me, the passenger window rolled down. In the passenger seat was Anne. “How are you doing?” she inquired. “Doing great.” I replied back. 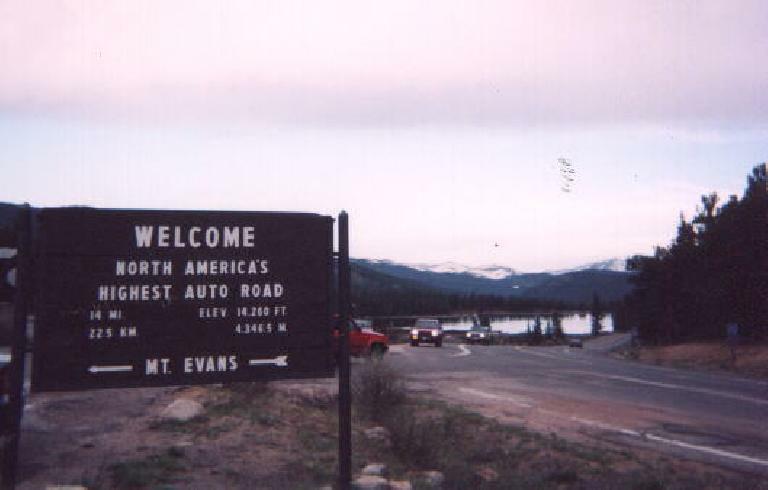 Indeed, here I was among the pines, on a gorgeous mountain road, nearing the top of North America’s highest paved road, having a splendid time. No headache, no body aches, just a natural high afforded by clean mountain air and attaining a spiritual peace with oneself. On paper, this race looked daunting, if not completely insane, but perhaps due to the comfortable pace I was going, it really didn’t seem that bad. It didn’t quite occur to me at the time, though, that at a 12.5-minute-mile pace, 2.5 miles is still a good half-hour away. I also did not realize at the time that my split times were significantly worsening, perhaps due to the contentment that the finish, in my mind, was virtually a foregone conclusion. Meanwhile, a light dusting of snow began to fall on us. As I had not seen snow all year, never venturing outside of Northern California in 2003 until now, I thought this was pretty cool. “Wow, snow in June.” I thought. At least I now had the sense of mind to take my windbreaker out of my left jersey pocket and put it on. Next came the beanie hat out of my right. My arm warmers, which for the last few miles were actually covering my arms instead of rolled down to my wrists like in the early goings of the race, were now covering my hands like makeshift gloves. No longer was I feeling like I had overdressed for the occasion. In fact, at this point it might have been wise to have brought a fleece jacket… or a parka. At this point I was no longer intermittently running. In fact, I can’t even say I was “power walking.” A stroll was more like it, which seemed to be underscored when, at Mile 13.5 or so, someone grabbed me from behind. It was Shane. “This is GREAT…” he enthused as our surroundings became evermore entrenched in whiteness. I was really happy to see him, and his catching up to me brought memories of the 1999 Silicon Valley Marathon to my mind, in which my buddy Dan Lieb had similarly caught up to me with one mile to go and we got to finish together. I then had visions of Shane and I finishing together. These visions soon quickly got knocked from my head, as snow, sleet, and freezing rain started pelting me in the face. The winds had picked up considerably. What had just minutes before had been a light dusting of snow teasingly befalling upon us now became a full-force fury of icy objects impeding our vision. Indeed, I was losing sight of Shane. It wasn’t that he was getting far ahead of me, but rather, it was becoming quite impossible to look ahead. Every time I tried, there was more snow in my eyes, nose, and face. I resigned myself to looking squarely at the ground as I walked, just trying to follow Shane’s footsteps or, failing that, make out tire tracks in the snow in the opposing lane. At one point, I did hear Shane yell out “it’s probably just over half a mile to go.” He started picking it up, running backwards. Good idea. I tried it, only to realize that I am not good at running backwards uphill. I then conceded that I’d have to continue walking (or rather, at times, actually “skiing”) face-forwarded to the snow and ice, with my head completely downward or, in some instances, buried in my arms, which acted as my shield. From time to time, I would touch my left cheek. It was very soft, very cold, but I still had some feeling in it. Barely. Soon it became complete white-out conditions. I had completely lost sight of Shane, but at this point, all I wanted to do was get to the top and jump in a car. I stopped and stared at the driver. “But I haven’t finished yet,” I began to muster. “THANKS.” I replied. That was all that I needed to hear, and I took off. Half a mile. What would seem like a completely trivial distance was now a matter of survival. It was a race again submission to the cold. Funny, though, at the time, I had entirely ceased to think about the cold. I was thinking about whether or not the race was indeed being called off. At this point I was REALLY hoping that there would even be people up there recording race times, verifying that I had finished… bearing witness that I had, yes, survived. So, for the first time in miles, I was in a trot. And at last. The finish. Some hardy souls, flanked by “Mountain Rescue” dudes with large packs and ice axes, were out there to cheer me on, and record my finishing time. I hands were so numb at this point that I could not even unzip my windbreaker for access to my bib number. So one of the staff members lifted up my windbreaker, and collected it for me. Finished. I could hardly talk, much less use my hands, but I had one final request before getting the hell off of this mountain. “This probably sounds silly,” I said to the timekeeper, “but could you take my picture for me?” I sure as heck was going to have something to show for sticking it out in this crazy weather. And so this picture (left) was then taken. Notice that I was getting pelted by so much snow and ice that I could not even open my eyes for it. And look at my beanie–it was completely hard and frozen, from all the ice that had collected in it as the top of my head “lead the way” in the final 2 miles. My arm warmers, covering my hands, were godsend, though ultimately they’d not be enough to prevent a minor case of frostbite. After the picture was taken I walked on by a car, in which the passenger window quickly was rolled down. “Get in,” said Shane. Oh, so there he was. And so in the safety and sanctity of a Subaru it was. The race was now over for Shane and me. And though I wouldn’t quite know it right away, but it was also over for all of those who were more than 10 finishers behind me. The race was indeed being called off due to overly dangerous conditions, and those farther down below were being picked up. Meanwhile, I couldn’t help but exude my joy in the car. These were amazing conditions–never had I seen a snowstorm so intense, so capricious–and that Shane and I had stuck it out and made it in such conditions, not to mention at altitude, made me proud. “We did it.” I couldn’t help saying. But my glee soon turned to more practical matters, such that I was completely unable to bend my left index finger. It was really cold and numb. One of the staff members in the car graciously offered to try to warm it up by wrapping her hands around it. After about a minute of that I could bend it again (although for about a week afterwards the finger would still tingle). She also handed Shane an additional jacket to cover up his bare legs. These were acts of kindness most appreciated and I only have the best of things to say of the organizers and their organization of this event. Meanwhile, Shane starting saying under his breath, “I think I’m in trouble here.” He could not warm up. He asked if that was the hottest the heater could get. The driver of the Subaru explained that it was so windy outside that frozen air was just blowing through the radiator and it was unlikely the heater would not get any warmer. At that point Shane made a quick decision that he was going to go over to one of the other SUVs to try to warm up–one that also was going to go down the mountain right away. The next thing I know he was out of the car and scrambling over to… some other vehicle, I guess. It was snowing so much I could not see where he headed off to. “Good night,” he said, before leaving. A few moments passed and the driver then turned to me, shaking his head. At that point I started to become concerned myself, and regretted now following Shane into whatever vehicle he went to to make sure he was okay. Yet, in my mind I knew he was a tough guy, and was optimistic that he was all right. Now it was a matter of what I was going to do. I had sufficiently warmed up in the Subaru and was comfortable, but the driver made it clear that he would be leaving the top of the mountain quite yet as he needed to offer further logistical support. However, another wonderful staff member found a Ford Expedition that was about to go on down, and advised me to go over to it. I hopped out of the Subaru, and ran over to it. In these 5 seconds I could not believe just how cold it was. And we had actually be racing in these conditions? A couple of other people soon joined me in the vehicle (one whom we had picked up on the way down), including a woman who was the very last person allowed to finish the race. She had done the race last year, and this year her times were better, despite the conditions. The driver of the Expedition confirmed that in the last 5 years that he had volunteered for the event, he had never seen a snow storm anything like this. 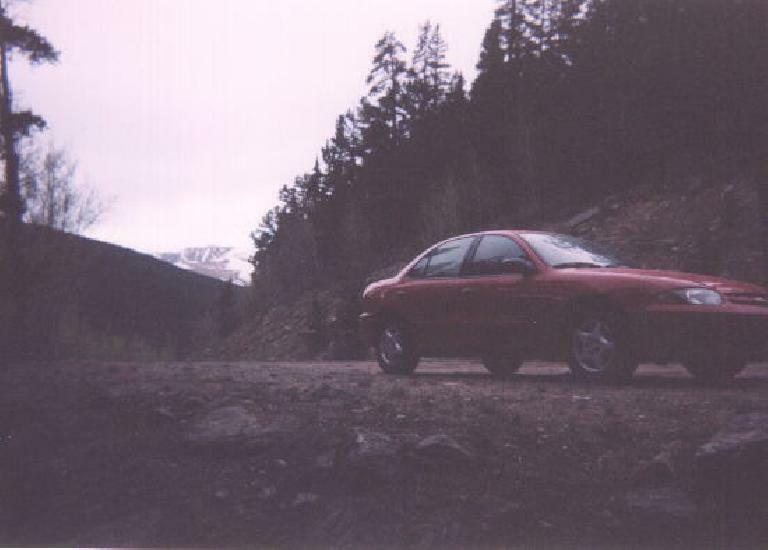 In retrospect, the 2003 Mt. Evans Ascent easily had the potential to be one of the Top 10 Toughest Events I Had Ever Done, were I not allowed to walk so much in the second half. 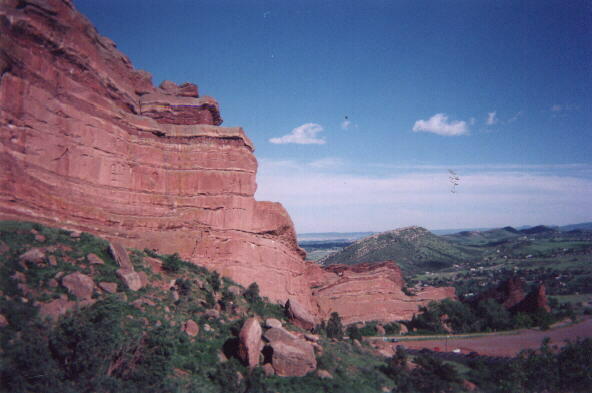 As such, though, all the walking kept my body fresh, fresh enough to go for leisurely hike in Red Rocks State Park in Golden, Colorado, later that afternoon. Regardless, for sure this events ranks among the top of memorable races, a crazy adventure away from the sun and tranquility of the San Francisco Bay area. I’m sure Anne and Shane would agree. Thanks so much for telling me about the race… boy that not one we will forget anytime soon. The car I was riding down in did not have a good heater and every one was very cooled. One woman in my car was dropped off for treatment at Mountain Rescue. So when I got down Anne put me in the car and we drove down to my friends house in Denver and spent some time in his shower. Don’t know if it was the cold or the race, but I was pretty out of it all day. But I’m so glad we ran it. I’m glad that you’re home and doing well. Shane told me when he got down the mountain that you and he had both been put in cars, which made me feel much better. I was very worried about both of you. I bailed at about mile 6 or so partially because I didn’t really have very lofty goals but also partially because it had started to get really cold and all I had was a heavy cotton sweatshirt. I caught a ride up to the top of the mountain with a really nice lady and then took the van down with some of the first race finishers. 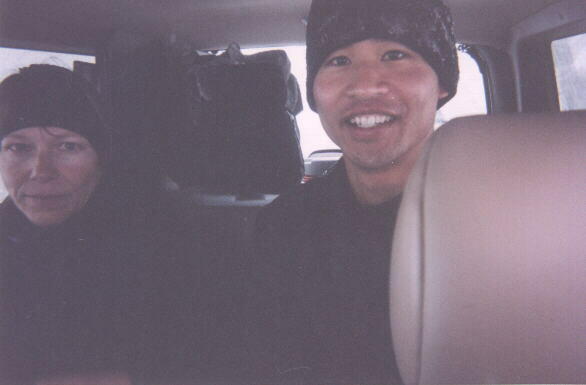 By the time we were in the van it had started to blizzard, and it was still blizzarding all the way down at mile 2 1/2. The conditions were already whited-out much of the way down. 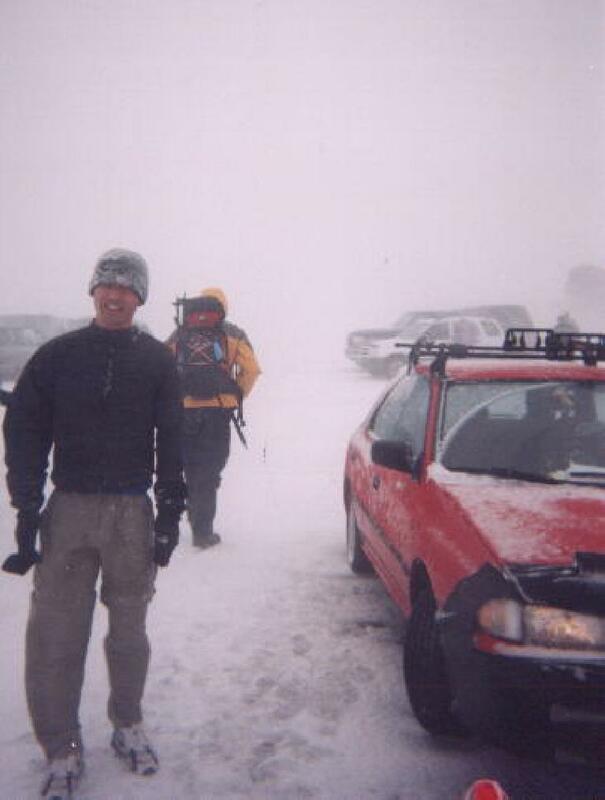 When I got to my car, the folks at the base station said that it was white-out conditions and a couple cars were stranded on the way up or down already and that I might be crazy trying to drive back up. At the same time another person said that it was a nightmare up at the top and that they were trying, only partially successfully, to get everyone into cars. I wasn’t quite sure what I should do. So, I was very relieved to finally see Shane and hear that you both were ok.
What a crazy event, huh? Still, I’m glad to have been there, seen the views and the mountain goats. Thanks for inviting us. You guys certainly earned the t-shirt. Weather: 1-. The weather at the top could NOT get any worse. Relative Difficulty: 5-. The only way this could have been harder was if it was steeper and/or longer. Overall Rating: 4. An asbolutely unforgettable adventure.